That’s a question many beginner banjo players ask themselves. “Should I start out with an openback banjo and work my way up to a resonator?” The short answer to all of that is no. It all depends on what you want to play. the Deering Goodtime and the Deering Goodtime 2. The Deering Goodtime banjo gives beginners the classic banjo feel and sound. An openback banjo, the Goodtime projects its sound out the back of the instrument,making it perfect for beginners looking to play the traditional (frailing) style. The Deering Goodtime is a light and sturdy instrument, built to last a lifetime and to be played on the road. A little bigger than its standard cousin, the Deering Goodtime 2 comes built with a resonator that projects the played notes forward instead of backwards, giving this banjo a warm and full sound. This makes it ideal for students looking to play bluegrass, also called three finger picking style pioneered by Earl Scruggs. Although the resonator makes it a little heavier, it’s still as portable and durable as other Deering banjos. Aside from the resonator on the Goodtime 2, there really isn’t much of a difference between the two banjos. They’re both built from the same materials, and you can play the same songs on both banjos in the same exact way. In the beginning stage either can serve the needs of anyone, but we suggest the open back for clawhammer (frailing), and the resonator model for finger picking and bluegrass. The reason for this is that each banjo produces the correct tone for the style being played. Which One is Better for Beginners? That all depends on what style you want to play the most. For more traditional pieces and styles of playing, we recommend the Deering Goodtime standard. For players looking to play more bluegrass, the Goodtime 2 offers the best tone to help beginners master the style. In short, both banjos are great for beginners, and will help them master their styles of choice every step of the way. Deering Goodtime banjos include a 6 year limited warranty on parts and workmanship. The warranty is non-transferable to subsequent owners. Our banjo experts professionally inspect and setup every banjo before it ships! 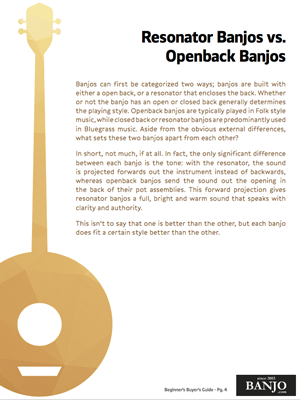 Download our free guide to buying your first banjo. Everything you need to know before you make a purchase! This entry was posted in Banjo Brands, Beginner Banjos. Bookmark the permalink. What are the differences between 4-String, 5-String, & 6-String Banjos?